Dry chemical fire fighting systems developed by SIEX are used to extinguish fires in special hazards requiring large quantities of this extinguishing agent, such as class A, B, C, K and D fires or hazards in open spaces (local application). They can also be used in fires affecting certain types of electrical equipment such as turbine generators and transformers. Dry chemical rarely needs the help of water to extinguish a fire with Class A materials, although it is not effective for extensive Class A fires. These systems can be designed for both a local application and total flooding of the protected area. The main commodities used in the production of dry powder are: sodium bicarbonate, potassium bicarbonate, potassium chloride, urea-potassium bicarbonate and mono ammonium phosphate. These products are mixed with various additives to improve their storage, yield and water repellency features. The most commonly used additives are: metal stearates, tricalcium phosphate and silicone covering the dry powder particles to confer fluidity and resistance to the effects of moisture and vibration. 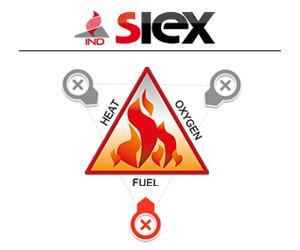 SIEX™ IND is mainly applicable for fires that require rapid flame knock-down, such as flammable and/or combustible liquid fires, leaks of combustible liquids or gases during transfer, loading or unloading and surface fires in solids. It is very useful in live electrical equipment fires. We have the following extinguishing agents: Universal ABC powder, BC powder and D powder. Please don’t hesitate to contact us if you need another type of agent.